The Light Cannon F-165 5500K High-Output LED Fresnel from Intellytech has a 5" lens that provides wide coverage with a variable beam angle from 15 - 50°. The F-165 has all of the benefits of an LED light source. It's very cool running yet manages to output the equivalent of a 1650 W quartz Fresnel while consuming just 1/10 of its power. That kind of post-purchase savings makes for a fast return on investment. What little heat that's generated is easily dissipated by the onboard fan which can be turned off when dead quiet operation is necessary. Light intensity is controllable from 0-100% without color shift from the light's rear panel, or you can control it remotely via its onboard DMX and monitor your settings on the F-165's digital display. The F-165 runs on 110-240 VAC current for worldwide use. Whether shooting in spot or flood mode, the F-165 provides the user with a high output of 165 Watts. The Light Cannon Series is capable of covering large areas. The lights are ideal for matching daylight shooting while its high CRI of 95-99 renders colors vibrantly and faithfully. Those who are shooting slow motion will appreciate flicker free performance up to 3,000 fps. The Light Cannon Series has a fan that can be turned on or off with the flick of a switch. When on, the unit has 100% power and the fan is whisper quiet. When the fan is turned off, the unit is completely silent and the output is reduced by 50%. The LED life is up to 50,000+ hours of use - equivalent to 15 years of daily use, 10 hours a day. The metal body housing is made using strong, lightweight, and attractive aluminum for years of use in a professional environment. The high-strength tilt lock provides extremely secure locking, eliminating movement and slippage, ensuring that the fixtures will stay where you put them. 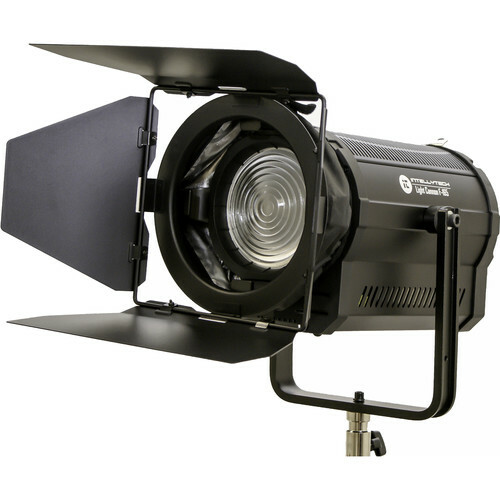 The Intellytech LED Light Cannon Fresnel is equipped with a built-in DMX 512 controller, allowing for brightness to be controlled remotely from a console, making it ideal for TV studio installations, theaters, stages, or conference rooms. The Light Cannon F-165 with DMX features an LCD touchscreen that provides the user with a high degree of control and information. Box Dimensions (LxWxH) 21.0 x 13.3 x 13.0"